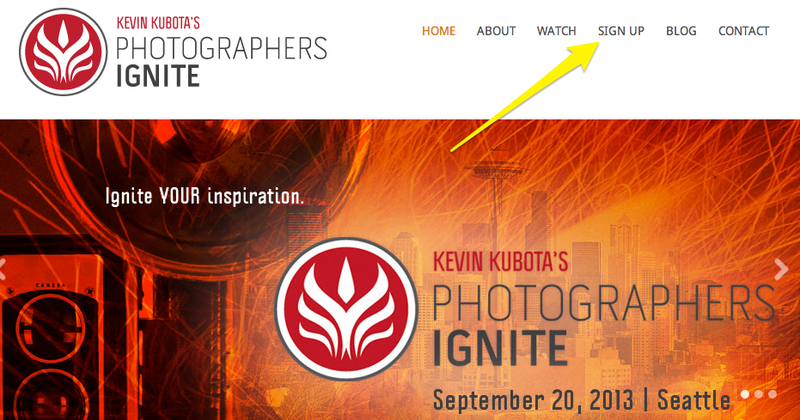 You can be a speaker on creativeLIVE with Photographers Ignite! Here is your chance to INSPIRE, EDUCATE and ENTERTAIN other photographers by being a presenter at our next event. Photographers Ignite is fast paced, high energy and SUPER fun! We are looking for 12 energetic people to submit now to present for an exhilarating FIVE minutes on September 20th, 2013. We'll be broadcasting from Seattle. With creativeLIVE on board, this presentation will be broadcast live around the entire world. So if you have been looking for a chance to share a unique idea or INSPIRE photographers, there is no better time than this! Also, the last time we teamed up with creativeLIVE, we trended number ONE on Twitter, so this is one event you won't want to miss! If you can be in Seattle, Washington on September 20th, please visit PhotographersIgnite.com and send in your one-minute submission video. We can't wait to hear from you! Speakers will be notified on Friday, August 16th and announced on August 19th. The event will be held on Friday, September 20th. Watch any or all of the past Ignite speakers on the site too, they're awesome!